There are only two major crude oil pipelines in Northern Michigan. One is owned and operated by Enbridge Energy, Limited Partnership and the other by MarkWest Energy Partners. The MarkWest Michigan Crude Pipeline consists of approximately 250 miles of 4-inch to 16-inch pipeline. 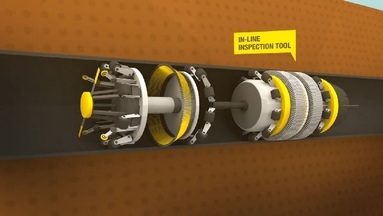 This line is connected to over 1,000 Niagaran Reef wells through 50 direct connects and delivers to the Enbridge Line 5 pipeline. The pipeline has four truck loading facilities and 15,000 barrels (630,000 gallons) of storage. Line 5 is a 645 mile petroleum pipeline owned and operated by Enbridge Energy, Limited Partnership. The line runs from Superior, Wisconsin, across Michigan’s Upper Peninsula, through Northern Michigan, down to the thumb region, and over to Sarnia, Ontario. Line 5 is 30 inches in diameter, except when crossing the Straits of Mackinac, where it divides into two 20-inch diameter pipes. The line became operational in 1953 and carries up to 540,000 barrels or 22.7 million gallons of light crude oil, synthetic crude, and natural gas liquids per day. 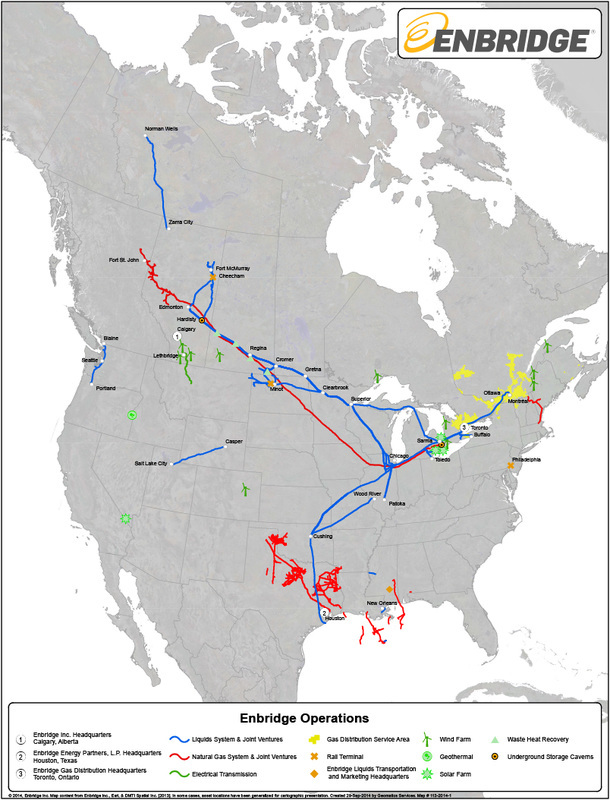 Enbridge operates the world's longest crude oil and liquids transportation system across the U.S. and Canada, and has a significant and growing involvement in natural gas gathering, transmission and, midstream business, as well as an increasing involvement in power transmission. Enbridge delivers about 2.5 million barrels of oil and an average of almost 7 billion cubic feet of natural gas each day. In total, Enbridge has 4 wholly-owned pipelines in Michigan, totaling about 930 miles of pipe: Line 5 traverses through Northern Michigan, Line 6B traverses across Southern Michigan, and Line 17 and Line 79 feed markets in Detroit and Toledo. In addition, Vector Pipeline is a joint venture between Enbridge and DTE Energy. Vector Pipeline is a 348-mile, 42-inch pipeline that transports approximately 1.3 billion cubic feet per day (Bcf/d) of natural gas from Joliet, Illinois in the Chicago area to parts of Indiana and Michigan and into Ontario, Canada. According to Enbridge, about 30% of the volume carried by Line 5 (35,000 barrels per day) is delivered to Marathon’s Detroit refinery as well as refineries in Ohio. In addition, Enbridge claims Line 5 delivers 65% of the propane that heats Upper Peninsula homes, and 55% of Michigan's propane needs. Much of the focus for Line 5 has revolved around the dual pipelines located on the bottom of the Straits of Mackinac. 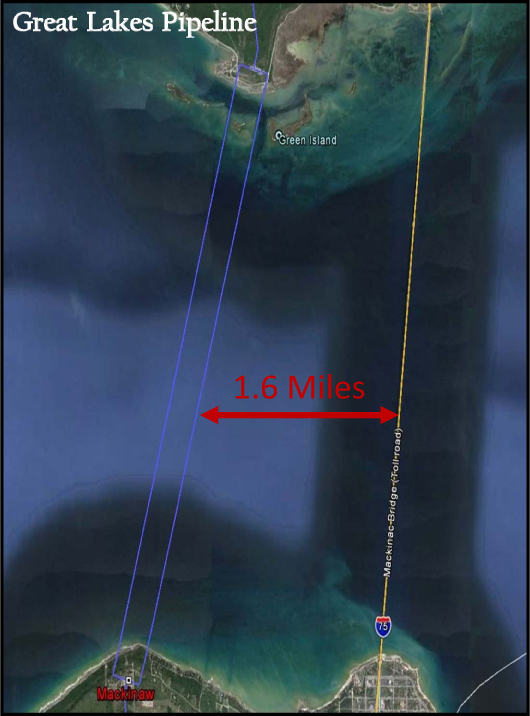 However, this represents just a small portion of Line 5, just over 4 miles out of a total 645 miles. The onshore portions of Line 5 pose just as much, if not a greater, risk to Michigan’s waters. 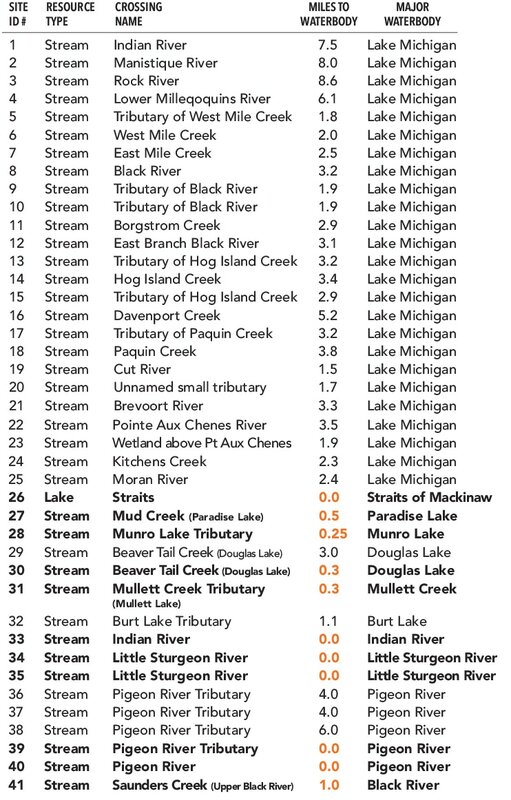 In the Upper Peninsula, Line 5 crosses 16 tributaries within 9 miles of Lake Michigan – 11 of those are less than 4 miles from the lake. That means an oil spill in this area would have a high likelihood of reaching Lake Michigan. In the Northern Lower Peninsula, Line 5 crosses the Indian River, Little Sturgeon River, Pigeon River, and Upper Black River and traverses within a few miles or less from many sparkling inland lakes, including Paradise, Burt, Mullet, and Douglas. These most important, diverse, and pristine water resources – our cherished vacation destinations and our way of life – are all at risk from Line 5. Enbridge monitors these river crossings through a combination of patrols, depth of cover surveys, and site visits. In particular, depth of cover surveys are conducted every 10 years at minor crossings and every 5 years at major crossings. The movement through Line 5 consists of natural gas liquids, such as butane, ethane, and propane, batched with various light products including crude oil and condensates. These light crudes and natural gas liquids are transported to multiple Great Lakes refineries. Additionally, the State of Michigan and Enbridge signed an agreement that prevents the transport of heavy crude through Line 5, except under certain circumstances. Heavy crude, in general, is heavier than water and will sink if released into freshwater. While Enbridge has never transported heavy crude through Line 5, there was concern that future demand for heavy crude by refineries served by Enbridge could result in heavy crude being transported via Line 5. Unfortunately, the agreement is weak, containing loopholes that could allow heavy crude to be transported through Line 5 in the future under certain circumstances. Under the agreement, Enbridge could transport heavy oil through the pipelines in the Straits if 1) the state approves changes to the engineering or operation of the pipelines that allows for transportation of heavy crude oil or 2) if Enbridge is ordered to transport heavy crude by a regulating agency. From January 1, 2009 until December 31, 2013, the following product types and quantities were transported through Line 5. Line 5 was constructed of steel and was installed with corrosion protection measures including a coal-tar enamel coating on the outside of the pipeline as well as cathodic protection. Cathodic protection is a technology that uses direct electrical current to counteract the normal external corrosion of a metal pipeline. The portion of Line 5 located in the Straits of Mackinac is a seamless pipe, which means there are no longitudinal seams running the length of the pipe joints. There are circumferential welds that joins one section of pipe to another. These welds were x-rayed and pressure tested prior to the line being put into operation. The pipes were welded together on the shore, placed on a series of launching rollers, and then pulled into the water by means of a cable extending from the head of the pipe to a large pulling winch. The pipelines in the Straits are buried 15 feet deep until a depth of 65 feet of water. Deeper than 65 feet, the pipes were laid on the lake bottom. The 20 inch diameter pipes in the Straits of Mackinac have a wall thickness of 0.812 inches. The rest of Line 5 has a minimum wall thickness ranging between 0.312 to 0.500 inch. The pipeline in the Straits of Mackinac was authorized under Public Act 10 by the Michigan Department of Conservation, which predated both the Michigan Department of Environmental Quality (MDEQ) and the Michigan Department of Natural Resources (MDNR). An easement was granted to Lakehead Pipeline Company, Inc. in 1953 for the pipeline. Currently, the MDNR holds the easement which contains requirements related to the design, material specifications, construction, and operation of the Straits pipelines. 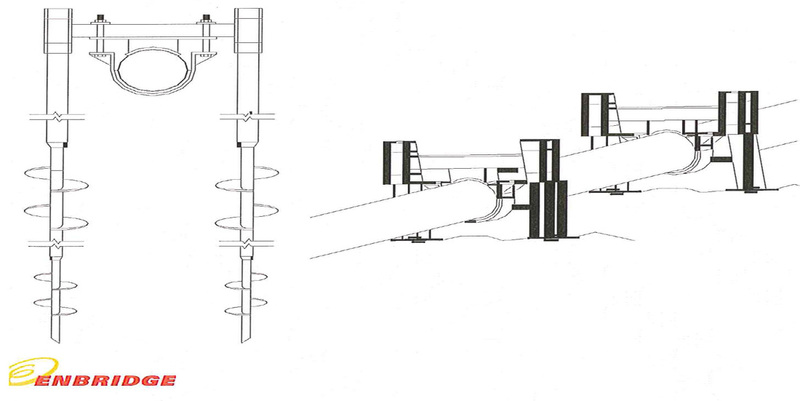 In 2002, Enbridge began installing screw anchor pipe supports. The anchors are ten-foot long steel screws that are augured into the lake bed on each side of the pipeline and hold a steel saddle mount that supports the pipelines. The easement with the State of Michigan requires that the pipeline be supported at least every 75 feet to ensure the stability of the pipelines running along the lake bed. It should be noted that “pipeline support” is interpreted by both Enbridge and the State of Michigan to mean screw anchor supports, the lakebed, or grout bags historically installed to provide support. Inspections conducted by Enbridge in June of 2016 identified four points along the crossing requiring additional support anchors in order to meet the 75 foot span reinforcement threshold defined within the Easement. The four spans meeting the threshold for anchor reinforcement were found to be slightly more than the 75-foot requirement, specifically one at 76 feet, two at 77 feet, and one at 78 feet. Installation of the 4 anchors was completed in the fall of 2016. Enbridge claims it is enhancing efforts to preclude spans growing to beyond 75 feet. This includes the installation of screw anchors on several spans that currently are at approximately 60 feet in length but are not anticipated to reach 75 feet even within two years. A variety of leak detection methods are employed including aerial patrols, line balance calculations, remotely monitoring pressure and flow from a control center, and using a computational pipeline monitoring system. Enbridge conducts aerial and ground surveys along the pipeline right-of-way at least 26 times per year and more, if warranted. In particular, aerial patrols are conducted for the pipelines located at the Straits of Mackinac at least every two weeks. Line balance calculations compare the volume of oil injected into Line 5 with the volume of oil delivered to identify any loss of oil, which would indicate a leak. Line 5 also uses a computer-based pipeline monitoring system that compares the expected pressures and flow rate to the actual measured pressures and flow rate. Discrepancies between the expected and actual values result in a leak alarm that initiates a shutdown of the pipeline. Unfortunately, even the most sophisticated leak detection system is not fool-proof. 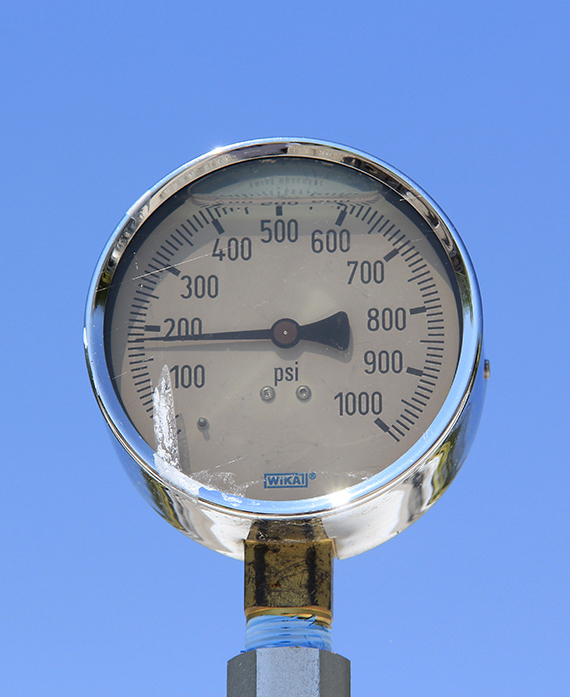 Smaller leaks can go undetected for long periods because they do not trip pressure or flow alarms. According to Enbridge, the quantity of oil that could be released without being detected by line balance calculations or the computer pipeline monitoring system is approximately 140,700 gallons per day! Typically, internal inspections are conducted approximately every 3-5 years using sophisticated electronic vehicles, called smart pigs. 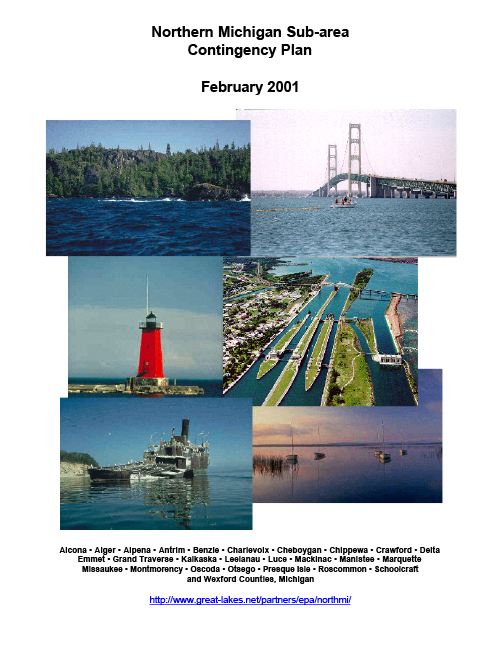 A 2016 federal law (PIPES Act) now requires Enbridge to conduct inspections of the portion of Line 5 located in the Straits of Mackinac annually. Smart pigs move inside the pipe along with the oil to obtain detailed information of the pipe condition including corrosion, dents, buckles, and gouges. Smart pigs can use ultrasound technology to detect cracks or Magnetic Flux Leakage (MFL) technology to detect metal loss that could be due to corrosion. If the smart pigs indicate any anomalies or potential problems, an integrity dig can be conducted to further evaluate the integrity of the pipeline segment. An integrity dig is a method used to make an actual visual inspection of the pipeline. According to Enbridge, in-line inspections in the Straits have never indicated a problem or need to conduct an integrity dig. The most recent in-line inspections at the Straits were conducted in 2013 and the next inspections are scheduled to be performed in 2018. The Watershed Council is working on obtaining the results of the in-line inspections to have a third party confirm the integrity of the pipeline within our service area. The Pipeline and Hazardous Materials Safety Administration (PHMSA) completed a third party independent review of the inline inspections on the portion of Line 5 located in the Straits of Mackinac. PHMSA engaged Lamontagne Pipeline Assessment Corporation to conduct its independent review, which involved examination of inspection reports of the Line 5 Straits crossing dating back to 1998. Enbridge also conducts external inspections of the pipe segments in the Straits of Mackinac on a biannual basis; doing a full inspection of the crossing every two years. 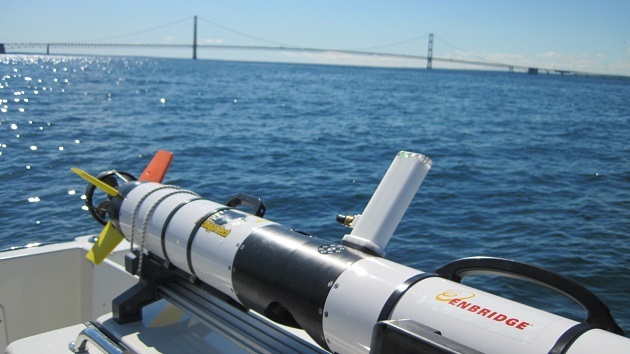 Enbridge uses remote operated vehicles (ROV) and autonomous underwater vehicles (AUV) to traverse the pipeline and get data on spans, anchors, and support structures. During these inspections the pipe is examined for coating damage, debris near or on the pipe, damage to the pipe, and the condition of the supports. The most recent ROV inspection was conducted in 2016. Line 5 is remotely controlled and monitored using a Supervisory Control and Data Acquisition (SCADA) system. The system is designed to remotely control the line, detect anomalies that indicate possible leaks, issue alarms, and initiate a shutdown, if needed. Through the SCADA system, the pipeline is monitored 24 hours a day, 7 days a week by two controllers from a control center in Edmonton, Canada. The portion of pipelines in the Straits have automatic shutoff valves where the valves will shut automatically in the event that pressure drops, starting a shutdown of Line 5. The pipelines are generally operated around 200 pounds per square inch (psi), with a daily range of 0-300 psi. The valve on the west line automatically closes if pressure levels fall below 65 psi and the valve on the east line automatically closes if pressure drops below 45 psi. These automatic shut-off valves take approximately 3 minutes to close. There is also electric backup generation at the Straits to make sure valves can operate in the event of a power outage. Based on the automatic shut-off valves closing correctly, the approximate volume of oil released from a single pipeline between the valves would be 4,950 barrels or 207,900 gallons. The estimate for the worst-case discharge at the Straits of Mackinac is 8,583 barrels or 360,486 gallons. According to Enbridge, this estimate reflects a worst-case discharge that could occur at the Straits in a real world scenario and takes into account pipe elevation as opposed to flat ground elevation. The rest of Line 5 has manual or remotely operated shut-off valves. A manually‐operated valve must be closed by pipeline operating personnel who must be present at the valve site. The time required to close a valve includes the time it takes to determine that closure is needed, the time for the personnel to arrive on site, and the time it takes to actually operate the valve. Remote controlled valves can be closed by a signal from a remote location such as the control center of a pipeline company. The decision to close a valve is made by a person who interprets pressure and flow data and determines that a pipeline rupture has occurred. The time it takes to close the valve may include time that is spent verifying that a rupture has actually occurred, and then the time it takes for the valve to close. The current maximum operating pressure of Line 5 is 600 psi. Line 5 has been pressure tested at 1,700 psi and is generally operated around 200 psi, with a daily range of 0-300 psi. Certain areas of Line 5 are designated as High Consequence Areas (HCAs). HCAs for oil pipelines are determined by population density and environmentally sensitive areas such as drinking water sources or commercially navigable waters. The Straits of Mackinac and Indian River are two particular areas in Northern Michigan designated at HCAs. That means they are subject to an Integrity Management Program. The Integrity Management Program (IMP) is a federal rule that specifies how pipeline operators must identify, prioritize, assess, evaluate, repair and validate the integrity of hazardous liquid pipelines that could, in the event of a leak or failure, affect HCAs within the United States. 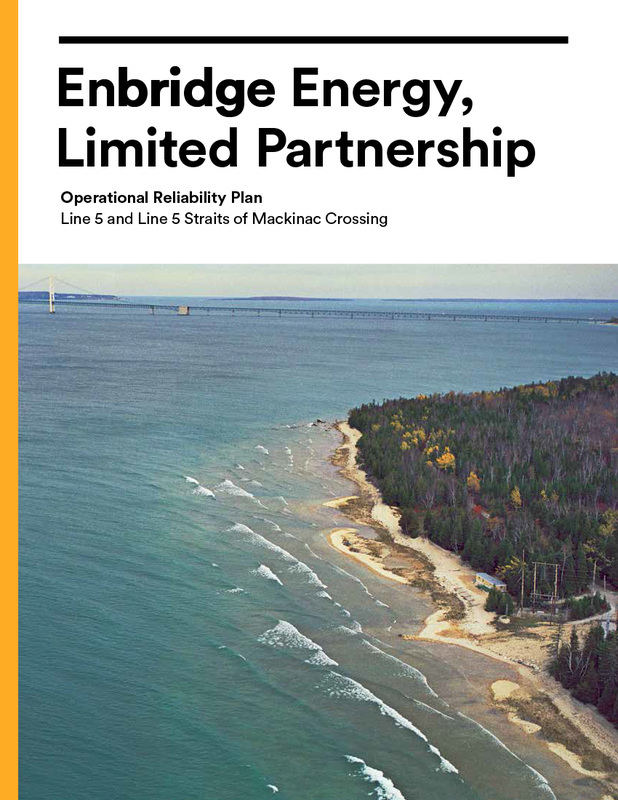 More information about Line 5 operations can be accessed in the Enbridge Energy, Limited Partnership Operational Reliability Plan. Pipeline operation and maintenance practices and integrity management programs are supposed to minimize the risk of a pipeline accident that could threaten the environment or nearby communities. However, pipeline companies, as well as local communities, also need to be prepared to respond, should a pipeline incident occur. Pipeline companies are required by law to develop and maintain Emergency Response Plans. These plans are comprehensive in nature and provide detailed procedures to guide emergency actions, notifications, and communications in the event of a pipeline incident. Multiple facility response plans have been developed for Line 5, including plans developed by the U.S. Coast Guard (USCG), U.S. Environmental Protection Agency (EPA), MDEQ, and Enbridge. An Integrated Contingency Plan is the core emergency response plan. It allows facilities to comply with multiple federal planning requirements required by various regulatory agencies by consolidating them into one emergency response plan. For example, releases of oil and hazardous materials are regulated under both the Oil Pollution Act of 1990 (OPA) and the Comprehensive Environmental Response, Compensation, and Liability Act of 1980 (CERCLA). Both mandate the development of contingency plans, and there is significant overlap in the type and scope of information required to do so. In order to minimize confusion and maximize resources, the two contingency plans are combined as an Integrated Contingency Plan (ICP). 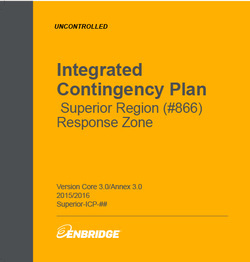 ​The oil spill response plan for Enbridge Line 5 is the Integrated Contingency Plan: Superior Region Response Zone, which was submitted, reviewed, and approved by PHMSA. The National Wildlife Federation (NWF) has filed lawsuits against PHMSA and the U.S Department of Transportation (DOT). According to NWF’s lawsuit, PHMSA failed to assess impacts on the environment, including shorelines, beaches, fish, and wildlife as required under the National Environmental Policy Act, as well as failed to assess impacts on endangered or threatened wildlife and plants as required under the Endangered Species Act during its 2013 approval of Enbridge’s emergency spill response plan. The lawsuit also asserts that PHMSA illegally approved plans for offshore portions of the Great Lakes pipeline—a power that resides with the DOT. There are also Area Contingency Plans that are developed to enhance the contingency planning of federal, state, and local agencies. These assure preplanning of joint response efforts and expedite decisions for the use of dispersants and other substances or mitigating devices. These plans includes a description of the geographic area; the environmental, economic, and cultural resources that might be negatively impacted by a discharge and for which protection is planned; descriptions of the responsibilities of the stakeholders in the plan; a listing of available equipment to an owner/operator and government agencies to ensure effective and immediate removal of a discharge; a description of the procedures for approval and use of dispersants; and a description of how the plan is integrated with other local, state, and federal agency and private sector plans. The subarea plan for our region is the Northern Michigan Sub-Area Contingency Plan. In addition, companies develop tactical plans to provide significant pre-planning information for responses in areas of high consequence. 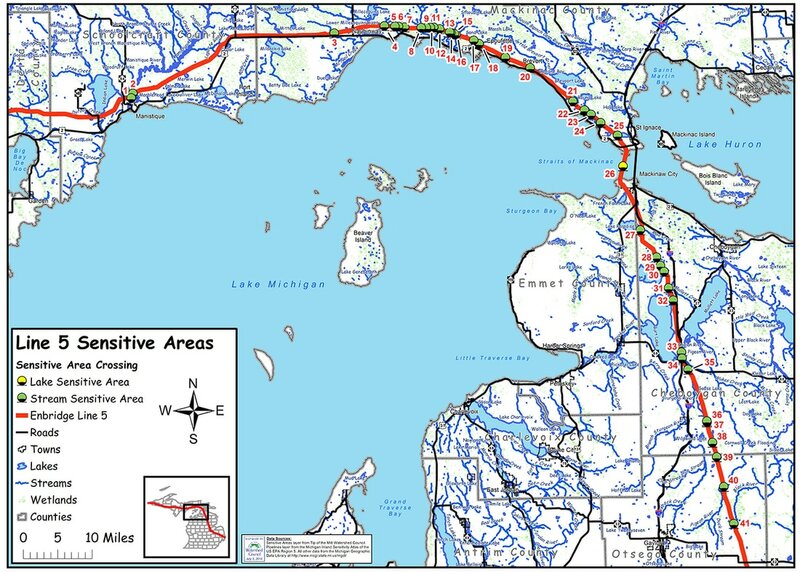 Enbridge has developed tactical plans for the Straits of Mackinac, Indian River, and Pigeon River areas. Response readiness goes beyond equipment. Personnel must be trained to react quickly and efficiently in the event of a spill. To achieve this, drills and simulations are regularly conducted by Enbridge in coordination with Federal, State, and Tribal government representatives as well as local community members. These exercises provide the opportunity to improve pollution response preparedness by testing contingency plans and practicing command and control. Enbridge held a large exercise in the Straits of Mackinac in 2012 and a full-scale Preparedness Response Emergency Program (PREP) exercise in Indian River in the fall of 2014. 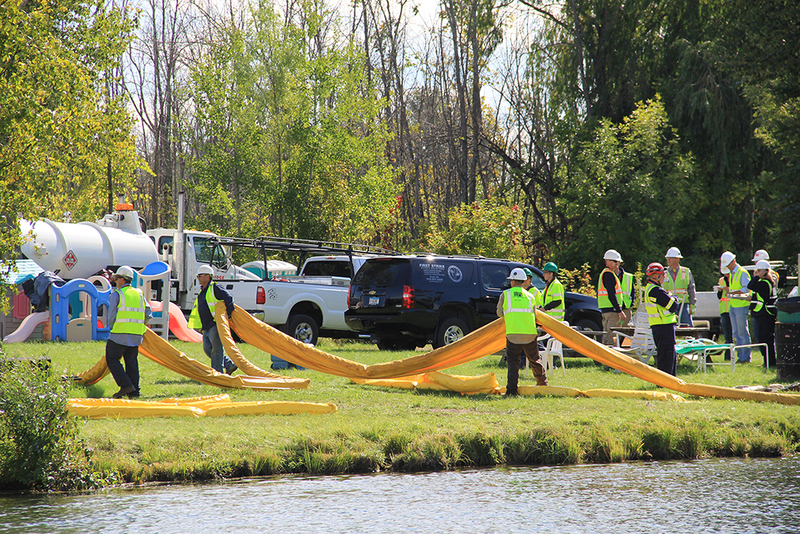 Watershed Council staff joined over 200 people in Indian River for a live simulated pipeline exercise. Amid hundreds of government representatives and private companies, we were on hand to observe and participate in an oil spill simulation. 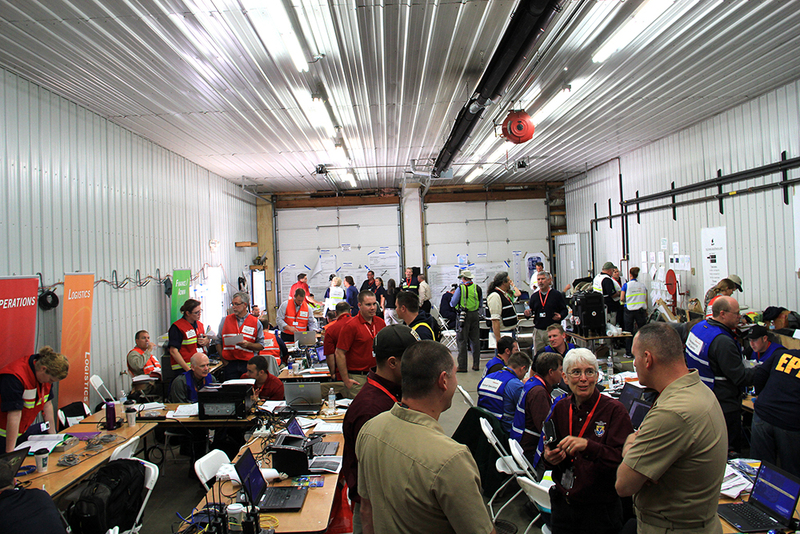 We participated as staff in the Emergency Operations Center, which serves as a central location for officials to coordinate response efforts, make decisions, and gather and disseminate information. We also took part in a wildlife rescue training. The exercise brought together key people who will need to work in tandem, should a real life emergency occur. It also provided an opportunity to identify deficiencies in the emergency response plan. As a result of the exercise, we identified areas that need improvement. Another large-scale exercise for the Straits of Mackinac is planned for the fall of 2015 and the Watershed Council will once again be participating. According to Enbridge, approximately 15 billion barrels of crude oil and liquids were transported in their pipeline system over the last 10 years and 99.9994 percent of that volume was delivered safely. However, there is an inherent risk associated with pipelines and accidents happen. Across the entire Enbridge liquids pipeline system, the total number of reportable spills between 2005-2014 was 763 with a total volume of almost 4 million gallons of product spilled. 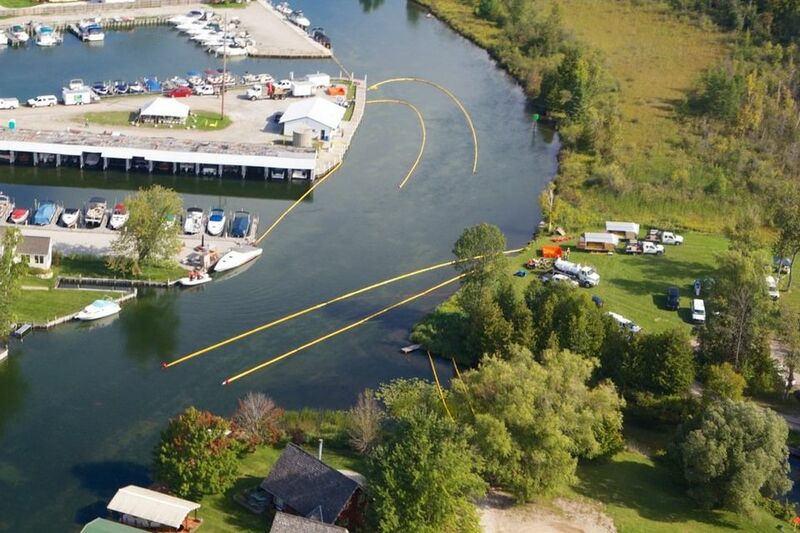 The majority of these spills are relatively small and occur on Enbridge property, such as pump stations. 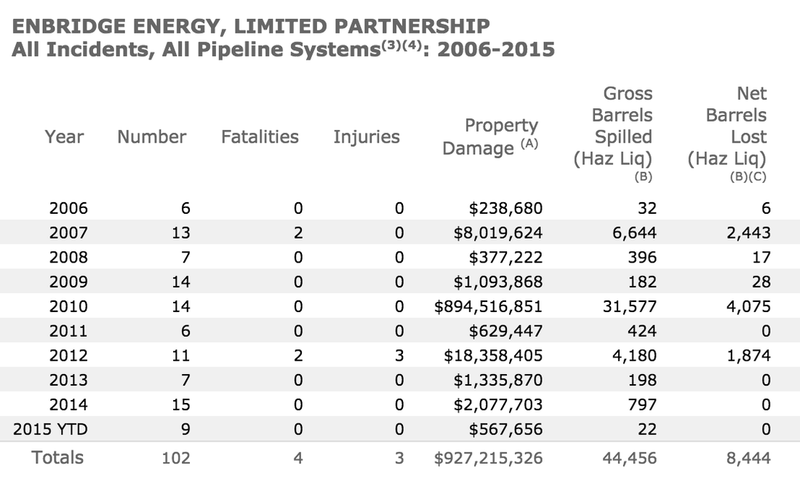 According to PHMSA, Enbridge Energy, Limited Partnership, which operates the 4,316 miles of pipeline in the states of Illinois, Indiana, Michigan, Minnesota, North Dakota, New York, and Wisconsin, experienced 96 incidents between 2006 - 2015.
incident report. All costs shown are as reported by the operator at the time of the incident. column displayed the sum of "volume released unintentionally" and "volume released intentionally" for all years after 2009. C. Net Barrels Lost applies only to Liquid incidents and is the difference between Gross Barrels Spilled and Barrels Recovered.